Iowa Teen Driving Accidents and Recoveries | Hupy and Abraham, S.C.
Could More Be Done to Prevent Teen Driving Accidents in Iowa? In the decade between 2004 and 2014, 622 people aged 14 to 19 died in Iowa car accidents. Many more teenagers were injured, and other children, teens and adults were hurt and killed. While teens only represent about 17 percent of licensed drivers in Iowa, they represent about 40 of people who are seriously hurt or killed in traffic accidents. What Is Being Done to Keep Teens and Other Motorists Safe? A teen driver—like any other driver—has a legal responsibility to obey all traffic laws and to drive with reasonable care. The government and parents, however, can also help encourage teen driving safety. A teen may get an instruction permit at age 14. The teen must pass a written test, pass a vision test, and have written consent from a parent or guardian. This allows a teen to drive at any time with a supervising adult in the vehicle, but it does not allow the teen to drive alone. A teen may get a minor school license at age 14½. A minor school license is available to a teen who has held an instruction permit for at least six months with no violations, who has completed an approved driver’s education course, and who has written permission from his or her parent and school superintendent, principal, or school board chair. It allows a teen to drive without a supervising adult in the car between the hours of 5 a.m. and 10 p.m. to get to and from school and school activities. A teen may get an intermediate license at age 16. In order to get an intermediate license a teen must have held an instruction permit for one year with no violations for at least six months, complete a driver’s education course, and must have written parental permission. An intermediate license allows a teen to drive without a supervising adult except for the hours between 12:30 a.m. and 5 a.m. Drivers with an intermediate license are limited in the technology they may use and the number of passengers they may have in the vehicle. However, a parent may waive these restrictions under certain circumstances. In 2015, the Des Moines Register reported that passenger restriction waivers were issued on about 87 percent of intermediate licenses—calling into question whether the Iowa graduated license law is effective. A teen may get a full license at age 17. The teen must meet all the requirements of an intermediate license and have written parental permission. There are no restrictions on full licenses. Parents can also help keep teens safe by creating safe driving rules and enforcing them at home. Not every traffic accident that involves a teen driver is the fault of a teen driver. However, a teen driver may be distracted, inexperienced, or otherwise negligent and cause a serious crash. 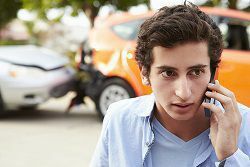 If you’ve been injured in an accident with a teen driver, then it is important to find out exactly what happened so that you can protect your rights. Please start a live chat with us now to schedule a free consultation with an experienced lawyer so that you can be sure that your rights and your potential recovery are protected. What Kinds of Injuries Are Caused by Iowa Car Accidents? ?Who can start a lawsuit after an Iowa car accident? ?How long do I have to file a car accident case in Iowa? ?Do I need an attorney after an Iowa rideshare accident, or will the rideshare company protect me?